This recipe is very easy and so amazingly good it will have you sneaking back to the tin for more! 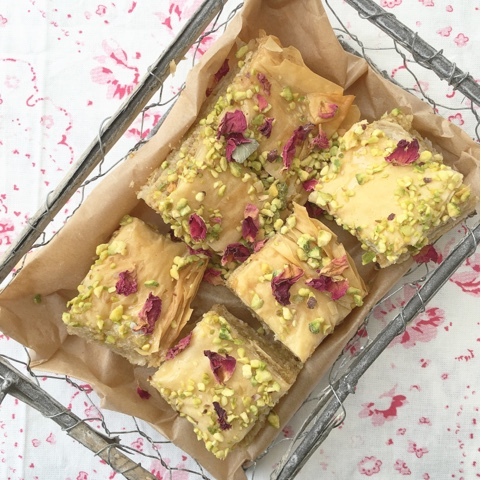 Ingredients- 1 box of filo pastry, about 150g melted butter, 150g chopped pistachio nuts, 200g ground almonds, 100g soft brown sugar, 2tsp cinnamon, 1tsp all spice, 1tsp nutmeg, dried rose petals to decorate. For the syrup- I make a sugar syrup using roughly 175g granulated sugar to 300ml of water, however, since chatting to one of my mums friends who is a lovely Greek lady, she told me to replace this with good quality runny honey, this would make the recipe even easier! Melt your butter and cut your filo to fit your tin, I like a small rectangle one so I can build the layers up. In a bowl mix together the nuts, spices and soft brown sugar. Reserve a handful of pistachios for decoration. 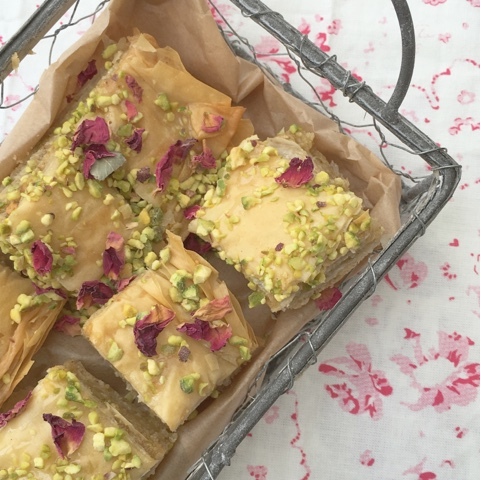 Lay your first sheet of filo and brush with melted butter, repeat three times, then sprinkle a good handful of your nut mix and repeat with the three sheets of filo and butter making sure you coat each layer with the butter. Repeat both these steps till everything is gone, you should have at least three layers of your nut mixture in there. Score into squares with a sharp knife cutting nearly to the bottom. Bake at gas 4 for about 20 to 30 mins or until golden brown. Once cooked, whilst it's still hot drizzle over the honey or sugar syrup, give it a really good coating, then leave in the tin a few hours for it to soak up all the honey. 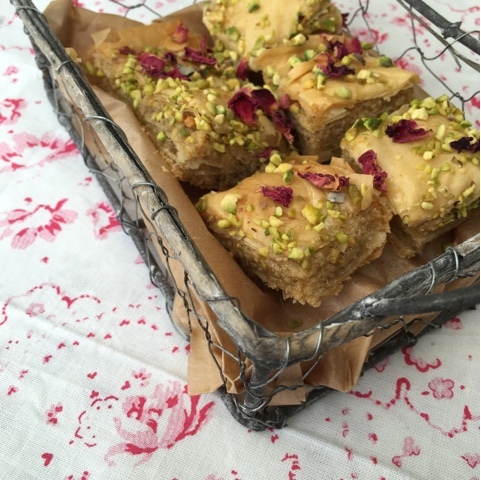 Cut into squares and sprinkle with rose petals and pistachios. Will keep in an air tight tin for a week, but trust me it won't be around that long! I'm sorry but I don't know how to navigate your blog. It is all lovely to look at, the pictures. But.... How does one find the latest post?